﻿	Slick Extra Virgin » Are Some Edible Oils Potentially More Fattening Than Others? Are Some Edible Oils Potentially More Fattening Than Others? I often get asked whether extra virgin olive oil is more fattening than other edible oils. Given the frequency that the question is posed, I’ll assume that there is some ‘information’ out there somewhere saying that it must be so. Or perhaps it is just a case of people thinking that if extra virgin olive oil is so healthy for you then it must have some downside. Can’t have your cake and eat it too right? So I searched the peer-reviewed scientific literature to find out the energy (or calorific) values of different edible oils. Two papers provided some relevant data. Fassinou et al. 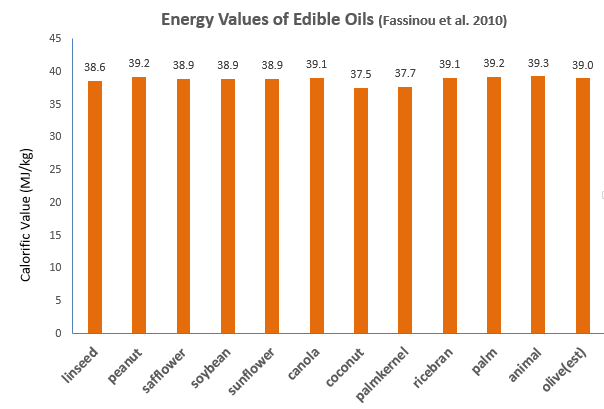 (2010) measured the energy values for a wide range of edible oils (Figure 1), but unfortunately olive oil was not one of them. However I’ve provided a logical estimate of the energy value of extra virgin olive oil based on the predictive model that they derived (1). Figure 1: Energy values of various edible oils. Value for extra virgin olive oil is an estimate. See footnote 1. Sadrameli et al. (2008) determined the energy values of the free fatty acids themselves (actual edible oils comprise 3 fatty acids of various sorts joined together to a glycerol molecule, not as individual free fatty acids). 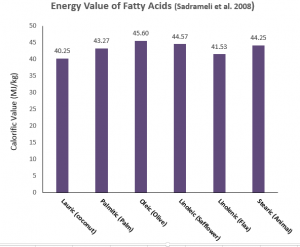 However, these values can presumably be good proxies of the energy values of the edible oils that are rich in a particular fatty acid (oleic acid makes up on average ¾ of the fatty acids in olive oil for example) (Figure 2). However as all edible fats comprise a mixture of fatty acids combined in various combinations in groups of three, this data is at best an estimate of the energy values of real edible oils. 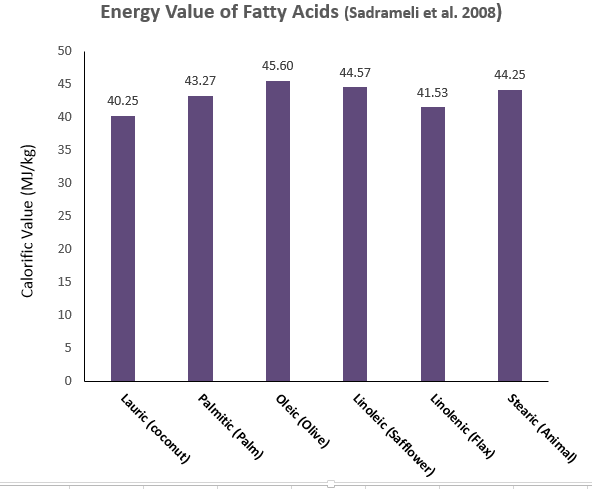 Figure 2: Energy values of different fatty acids. Examples of edible fats that have high proportions of that fatty acid are given in parenthesis. So what’s the conclusion? 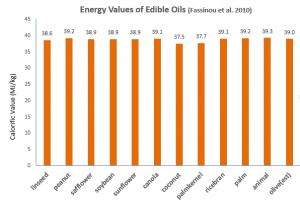 There is no practical difference in the energy values of the different edible oils. OK, these results do not consider that our bodies may absorb one type of fat differently from another. Some have suggested that we absorb short chain fatty acids such as those found in coconut oil differently. You can read more about the good, the bad and the ugly of this possibility elsewhere in this blog (search for coconut oil in the search box to the right), but based purely on the maximum potential of each fat to contribute to our daily energy intake, there is little evidence of any practical differences between edible oils when it comes to their energy quotient (2). (1) The energy value can be predicted from the ‘carbon number’ of the oil. The carbon number is the average carbon chain length of the fatty acids that comprise the oil. In olive oil the carbon number averages 17.5 (based on the fatty acid profiles of 500+ extra virgin olive oils reported by Mailer and Ayrton 2008). The energy value of the ‘typical’ extra virgin olive was then estimated using the predictive model derived by Fassinou et al. (2010)..
(2) To save you scrambling for your abacuses paleo people, coconut oil has on average 3% lower energy value compared with the other oils, which is due to the lower average carbon number of the predominant fatty acids in coconut oil. 3% less energy but 90% less antioxidants. Take your pick. There is some evidence that the really short chained fatty acids found in coconut oil are absorbed differently, but then again this doesn’t mean that the end result is different. I reviewed the literature on coconut oil some time ago, and have been keeping up the the peer reviewed scientific literature on it since. I did a minor revision recently, but nothing has been published to warrant any major changes to the thrust of the original post. But I should point out that it is not widely known that the palm oil industry has recently invested heavily in coconut oil production. The extensive well thought out commentary is well worth a read.